A small group of gentlemen with the leisure and resources to do whatever they choose, and without having anything particular to do, accompany Mr. Samuel Pickwick on his adventures to explore the more curious portions of the world — as long as they are not more than a two-day stagecoach drive from London, and there is assurance of a comfortable inn at their destination. There follow 57 chapters of silliness, in which Dickens alternately lampoons and lovingly illustrates personalities and customs — some truly absurd — of laborers, lawyers, medical students, journalists, coachmen, servants, businessmen and the idle and pretentious sub-aristocracy of the 1820s (supposed period of the Pickwick Club) or '30s (the novel began to appear in 1836). Young Dickens (then 25) was invited to write text to accompany comic sketches of sportsmen by illustrator Robert Seymour, and at first he seems to have had no clear idea of how to develop it nor anything about the characters beyond the funny names he assigned them and the physical appearance that Seymour had given them. After the first installments, Seymour (who had a history of mental problems) committed suicide, but by that time Dickens' narrative inventions had already taken priority, so that instead of the text following the sketches, the sketches had to illustrate the new text, as other artists (R. W. Buss, briefly, and then Hablot Knight Browne, "Phiz") succeeded Seymour. Among the more memorable episodes is Pickwick's unequal litigation with the shyster lawyers Dodson and Fogg and Pickwick's subsequent sojourn in debtors' prison because he refuses to pay the obviously unjust sentence of costs and compensation for a breach of promise he never made (brought by a hysterical widow who mistook the overly-polite Pickwick's inquiries about lodgings as a proposal to marry). The story eventually becomes clear and the characters more clearly defined, especially Pickwick's cockney manservant Sam Weller, the quick-witted scoundrel Jingle, and Sam Weller's marvelously drawn coachman father, full of false wisdom mispronounced, generous and well-disposed to all but ready to fight for honor and justice when he thinks these have been offended. Especially delightful to any of us in the trade are Dickens' wry comments on the craft of writing. There are many, including the nearly-illiterate Sam Weller's efforts to compose a love letter. But I'll quote only one, near the end (Ch LVII) of this long serial, which is an observation on the work itself: "It is the fate of all authors or chroniclers to create imaginary friends, and lose them in the course of art. Nor is this the full extent of their misfortunes; for they are required to furnish an account of them besides." 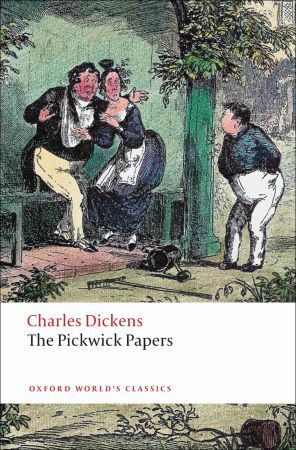 In this, his first long work of fiction, Dickens has succeeded to the delight of many thousands of his contemporaries and to generations ever since. Sign into Goodreads to see if any of your friends have read The Pickwick Papers. It's a lot of fun in many places, Michael. There's even some sharp social critique buried within the silliness. It's easy to see why it was such a huge publishing success in its day. Lots of different kinds of readers could find somebody to identify with, or laugh at.